Having written blogs ‘as and when’ up to now, I’ve decided, for the seven months leading up to the start date, to write weekly blogs, with a round-up of everything I’ve been up to and the latest updates on sponsorship. I’ll publish these each weekend, so keep an eye on your inbox for the most up-to-date news. Apologies for this mammoth post – a combination of deadlines, work and some time away from Bristol has meant that I’ve allowed a number of blog topics to run into each other. A month ago I went away for a training weekend and rowed from Lyme Regis to Lulworth Cove, with an overnight stop in Portland. I’d been looking forward to the trip a lot, but I’d also been slightly concerned that I might be jumping in out of my depth: the other four rowers were all men who had already rowed at least one ocean, and who had a number of world records stacked up between them. Although I rowed at university, and have done a lot of indoor rowing since, I hadn’t actually been on the water for 3 ½ years, and had only ever been sculling (rowing with two oars) once. Like cycling or swimming though, rowing seems to stay with you, and I was pleased to find that I could quite easily keep up with everyone else. I’m glad to say that I really enjoyed rowing on the sea, and although coastal rowing boats are very different to ocean rowing boats, the experience was really useful as well as fun. I love the Jurassic Coast. A couple of years ago I had a sunny camping and walking trip along the same stretch of coastline, and memories of this kept floating up as we rowed last month. My body was very much in the boat, but the repetitiveness of the oar strokes allowed my mind to wander through the layers of stories and history along the Jurassic Coast, as well as my own memories. All the way past coves and cliffs, as we rowed, I was reminded of shadowy figures: the French Lieutenant’s Woman staring out to sea from the Cobb at Lyme Regis; Mary Anning fossil hunting along beaches; Florence and Edward’s fatal misunderstanding in a hotel room near Chesil Beach; the people of Moonfleet village; Keats, pausing at Lulworth Cove before his final trip to Rome, and Hardy imagining him there a hundred years later, before ‘vamping’ home “across the lea” in the gathering darkness. 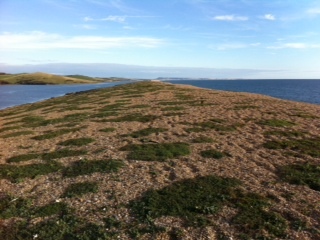 Chesil Beach: sea to the right and The Fleet to the left. 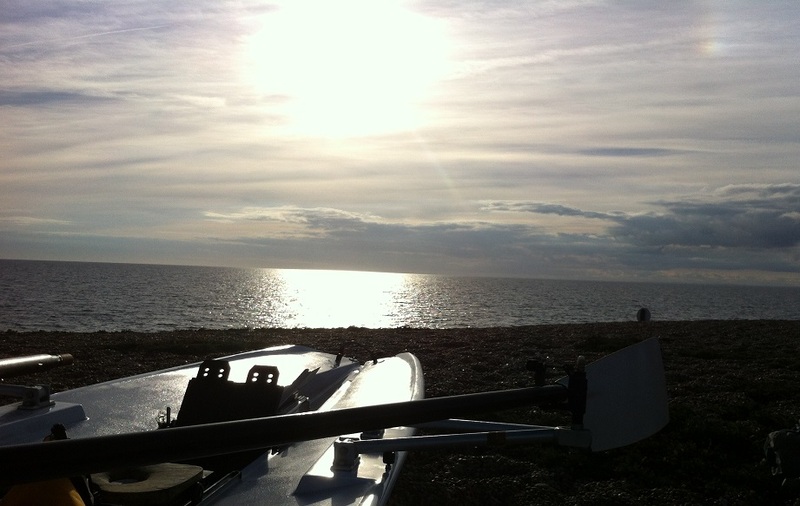 After a short rest, we carried all three boats over the beach to row the last part of the day on The Fleet, a lagoon that runs eight miles along behind Chesil Beach. The rest of the day remains in my mind a beautiful blur of the bright afternoon sun hanging low over Chesil Beach; the flatness of The Fleet compared to the sea on the other side; darkness creeping in; dark banks looming on either side; the strength of the tide flooding in and the ache of my muscles as we rowed against it; Portland Harbour, black and wide, with its tantalising lights twinkling across the flat water. I slept very well that night! The second day was as sunny as the first, and my stiff muscles were soon stretched out by rowing across Portland Harbour in the bright morning light. I found sitting quite sore though (I’ve since realised that I bruised myself, falling during the capsize on Chesil Beach), and Justin and I found that Chris’s foam seat cover was more uncomfortable than the wooden seat it was covering. How this was, we didn’t really know, but we ended up balancing it on the riggers so that neither of us had to sit on it. Although we were planning to stop properly at Lulworth Cove, we couldn’t resist pulling in at Durdle Door, just a couple of miles ahead. Durdle Door is an amazing arch of rock, reaching out into the sea just off the South West Coast Path. It’s a hugely popular spot for photography, as well as sea kayaking and coasteering. We decided to row through the arch, which took a little manoeuvring, as we could see quite a lot of rocks looming under the water on either side. The feeling of slipping under the great arch of stone was worth it though, and we even caught a bit of a wave to surf the last bit. I ached all over, and had huge blisters on my palms by the end of the weekend, but already on the train back I was looking forward to the next time I can get on the water for training. Yesterday I spent the day in Southampton, taking the VHF Radio course with Duck-2-Water. Six hours of presentation, discussion, numerous radio calls, and an exam later, I have a VHF Licence on the way! It feels good to have one of these courses completely ticked off. I’ve booked my Competent Crew course, and now only have the Sea Survival and the First Aid at Sea to find – if you particularly recommend any training schools in the Bristol area for these, please let me know. JBP PR came on board a couple of weeks ago to help out with the PR side of things. I’m really looking forward to working with them – we’re currently focussing on the VIP launch event in December. Thank you to Nigel Hunton of MBA Polymers, who has made a personal donation of £1,000. MBA Polymers are ‘the world leader at producing post-consumer recycled plastics from end-of-life durable goods.’ It’s brilliant to be connected with a company whose core values are so in line with my own regarding plastics, and Nigel has personally been very engaged too. The most recent cheque that arrived through the post was from the Hatfield College Trust. Hatfield was my college when I was doing my MA at Durham, and I am really pleased to be supported by them. Previous PostMBA Polymers: “a brave and enterprising attempt”Next PostWeek -29: Explore!